We're delighted to present an early evening concert for Christmas, with singers, instruments, organ and audience carols! And all FREE for under-18s. There's a hugely varied programme with something for everyone; old favourites like White Christmas and The Snowman, classics like Corelli's Christmas Concerto and extracts from Handel's Messiah, and traditional carols for audience. Tickets are just £11 in advance (£12.50 on the door) and it's FREE for children. The members of the Pentagon Ensemble have performed as Principal players with orchestras including London Philharmonic Orchestra, Royal Philharmonic Orchestra, Philharmonia Orchestra, Northern Sinfonia, Halle Orchestra and Strasbourg Philharmonic Orchestra. As chamber musicians they have collaborated with such artists as Alfred Brendel, Thomas Zehetmair, Ruth Killius, Heinz Holliger, Christian Zacharias, the Soloists of the Philharmonia and the Soloists of the LPO. Ellen Smith is a professional singers and harpist, and regularly plays for orchestral concerts and ensemble engagements. Particular highlights include performances of Britten's Ceremony of Carols in Westminster Cathedral and a Debussy world première conducted by Charles Hazelwood for the Broomhill Trust. Ellen enjoys an international career and has performed at the Salzburg and Istanbul Festivals and extensively throughout Europe. Congratulation to everyone who contributed to The King's Violin - a the magnificent concert featuring the last surviving violin from Charles II's court band. Pictured at the concert are the mayor and mayoress, Mr & Mrs Julian Stanyer, with Margaret Faultless and the historic instrument. You can download a copy of the souvenir programme here. Many thanks in particular to Dr Richard Luckett, Pepys Librarian Emeritus of Magdalene College, Cambridge, who inspired the programme and made the event possible. The King's Violin: a historic event for Tunbridge Wells. 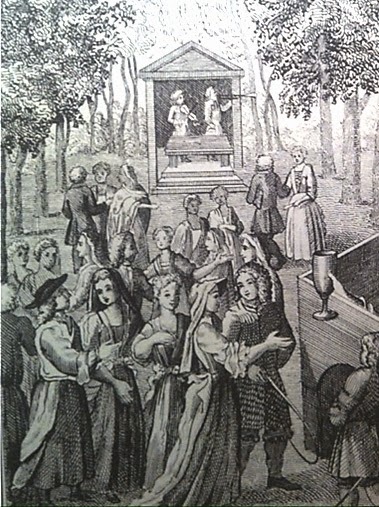 Court music of the English Baroque, concerning the visits of Charles II and Queen Catherine to the wells in 1663 and 1666. With eminent early music specialists Margaret Faultless (violin), Kate Semmens (soprano), Robin Jeffrey (lute), Steven Devine (harpsichord). Featuring the last surviving instrument from the very orchestra that played here on those royal visits. Download souvenir programme. 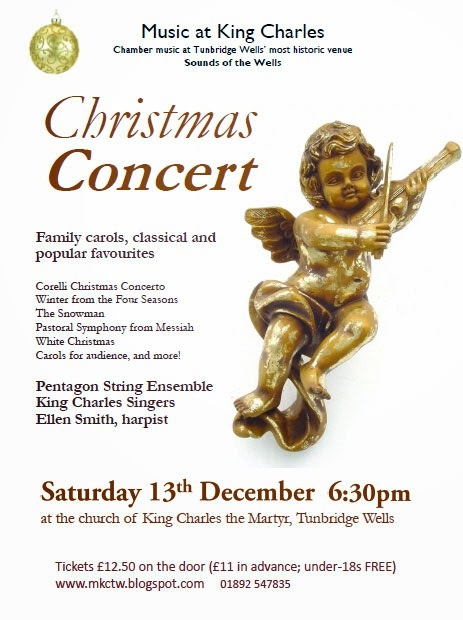 Family Christmas Concert: (note earlier time): popular classics for Christmas with the Pentagon String Ensemble and King Charles Singers. We're delighted to present an early evening concert for Christmas, with singers, instruments, organ and audience carols!